Kentucky's Hardlein is more proof that great hard rock is not dead in America. Their debut Down to the Fire is spot on bold arena melodic hard rock. There's no doubt about the depth of their influences: straight on American rock with huge hooks, catchy melodies reinforced by an impressive charging rhythm section and thrilling guitar fireworks. Some will say retro or old school, but the old school is the new school which is teaching the current angst-ridden Ritalin swallowing generation how it's done. With the oft charging boogie of AC/DC and the savvy riffage and hooks of KISS, Hardlein tears it up with infectious abandon. Hard Livin', Doin' Time, Lonely Town, and Wicked You are supreme examples of swaggering beer bottle rock, and a heck of a lot of fun. Don't look for navel-gazing, latte-sipping, emo swill across Down to the Fire for you will be sorely disappointed. Drivin' and Down to the Fire are songs to rock by and thump a few of those scarf-wearing alt rock girlie-boys. 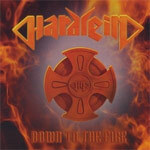 Hardlein's Down to the Fire is the real American hard rock deal. Very recommended! Hardlein's Down to the Fire is the real American hard rock deal: tons of hard driving, testosterone busting, rock bundled in huge hooks, infectious melodies, and ripping guitar work.